Several Taiwan-related news have surfaced this week. First, news agencies reported on September 2 that proposed defense budget for FY2013 submitted by National Security Bureau contains strong emphasis on strengthening cyberwar capabilities while scaling down overall budget. On September 4, Taipei Times reported on Ministry of National Defense’s report that China has increased number of ballistic missiles aiming at Taiwan by 200 over the last year. That makes total number of 1600 SRBMs/MRBMs, including small number of new type Dong Feng 16 (DF-16). Together with 200-500 cruise missiles, Chinese arsenal has reached 1800-2100 figure. Taiping Island, Taiwan’s stronghold in Spratly Islands in South China Sea, experienced live-fire Coast Guard exercise on September 1-4. The exercise took place amid increasing tensions in South China Sea. Last month, Taiwan strengthened defense of the island with mortars and anti-aircraft guns. Delegation of three legislators visited Taiping on the last day of the exercise. Three days later, President Ma Ying-jeou paid visit to Pengjia Islet (彭佳嶼), a feature in East China Sea, and urged trilateral (China, Taiwan, and Japan) talks over the disputed area of Diaoyutai Islands (釣魚台). Part of the visit was release of the details of East China Sea Peace Initiative, announced by Ma in early August. 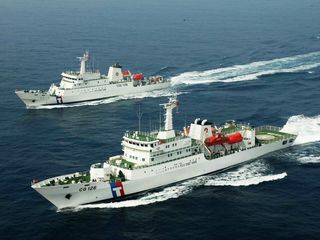 On September 5, Taipei Times reported on the Navy’s plan to build 6 mine-sweeping ships by 2024.